Monday brought little direction to the market as a whole, there didn’t seem to be much momentum in either direction. The indices experienced mixed outcomes as a result. The Russell led the way with a gain of 0.73% and it was joined in positive territory by the Nasdaq with a gain of 0.13% and the S&P with a gain of 0.07%. The Dow was the lone losing index with a loss of 0.21%. The sectors were also mixed in terms of results with six moving higher and four moving lower. The communication services sector moved the most, but that was a down move of 1.03%. The second worst performance came from the healthcare sector with a loss of 0.14%. The industrial sector was the best performing group with a gain of 0.53% and it was followed by the energy sector with a gain of 0.49%. My scans were as close to balanced as they could get last night, but they remained negative. There were 22 names on the bearish list and 21 on the bullish list for a differential of -1. The barometer jumped from -76.9 to -45.5 once these results were added in to the equation. The results of the bullish list last night were odd. There were 21 stocks on the list and 15 of them had EPS ratings between 60 and 80. I found that to be a statistical anomaly and double checked to make sure it wasn’t due to one sector dominating the list—the stocks with readings between 60 and 80 came from seven different sectors. I’m not sure what to make of it, but it definitely jumped out at me. One stock that didn’t fall in that category is the subject of today’s trade idea. CME Group (Nasdaq: CME) was on the bullish list, but its EPS rating is 90 and the SMR rating is a B. The bullish signal came from daily indicators, but it was the weekly chart that really stood out on CME. 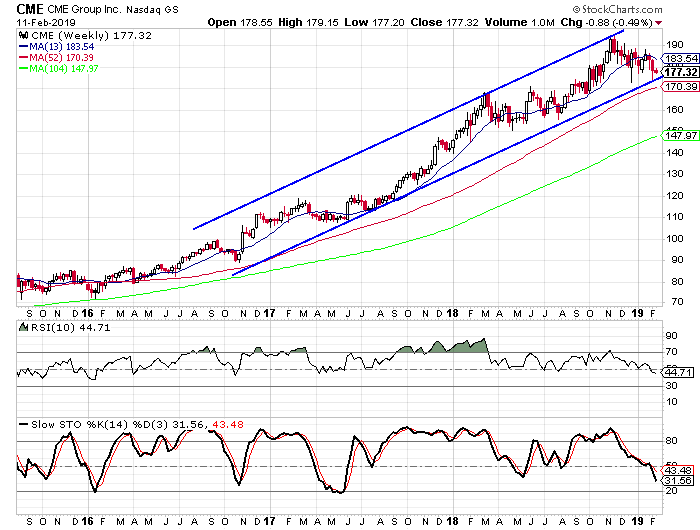 The stock has been trending higher for several years now and a trend channel has formed that defines the various waves within the overall trend. The stock just hit the lower rail of the channel it looks set to turn higher again. Buy to open the March Week 5 $172.50-strike calls on CME at $9.00 or better. These options expire on March 29. The options will double if the stock hits $190.50. This is below the November high, but above the January high. I suggest a target gain of 100% with a stop at $172.50.